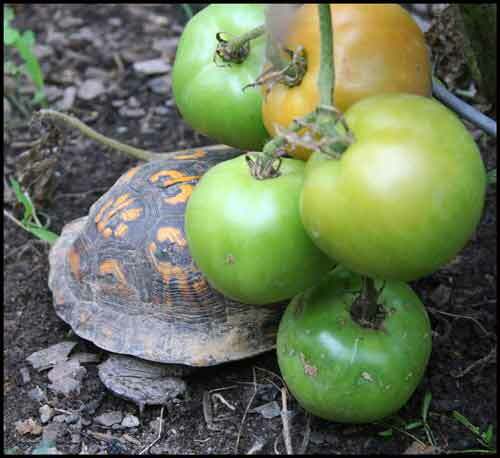 I knew someone–besides me–was eating my tomatoes. I blamed it on woodchucks, squirrels, even skunks. But now I know the truth, because I caught him red-handed. A short while ago I was sitting on the garden bench and saw one of the tomato plants swaying to and fro. At the bottom, I could see movement of some beastie attacking the low-handing fruit. On close inspection, I saw this Eastern Box Turtle standing on his two hind legs munching away. Oh, he looks timid now. But he is a tomato eating beast! To be fair, I have encountered him in the garden before–under flowers and leaves. But I had never put two and two together. You can bet he has a big move coming to a new home far, far up the driveway. I don’t take kindly to tomato thieves. He should pass that along to his friends before I get back out there.